We remove barriers to young people being involved in having a positive, lasting impact on their communities. We develop and connect young people and bring the youth voice space to life! We make cool stuff happen for young people in Chch! That's key! WESPEAK, TEDxYouth@AvonRiver, Turning The Tables, Election Debate, Spreydon-Heathcote Community Board Youth Panel, LYFE Festival 2016, Youth Voice Canterbury, Face2Face across the city, upcoming networking and training events for youth and soon-to-be Youth Hotdesk at CCC, recruitment two times a year, and so so so much more! We employ and manage a full-time Co-ordinator to ensure CYC runs smoothly whilst we are at school, uni and work. We decide what needs to be done and instruct our Co-ordinator accordingly. A dedicated office space filled with beanbags, free wi-fi and workspace. Represented at meetings we can't get to and kept in the loop via online comms. Project management of events like the CYC Amazing Race and collabs with other groups in the Youth Voice Canterbury network is much easier! We work with and support agencies who feel the same way we do about youth issues. We stay connected to decision makers to make sure they know the youth perspective and how best to work alongside us. Work with CCC, ECAN and other agencies in partnership and consultancy capacity. Active members of the Strengthening the Youth Sector project. Regular meetings with the people behind the scenes of the rebuild of our city to engage on youth issues. 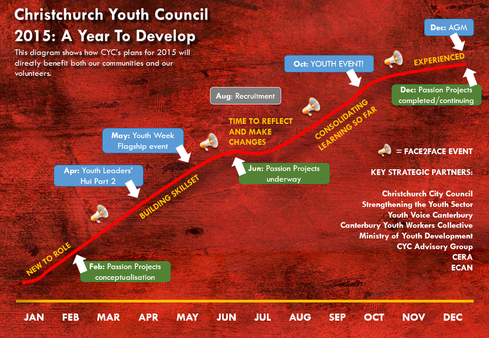 We took a very boring looking planning document and distilled it into a word cloud so you can see the look of things in 2019 for CYC. We're actively seeking feedback on what you want from CYC, so fill in the poll on our home page to let us know what matters to you! In 2016, was a year of growth. After the launch of the second pool of membership we needed to work to make sure that General Members felt part of the team! Our employee and office certainly helped us to grow faster than we imagined we could. 2019 brings us a relatively new team, prepared for action and ready to take on challenges. And there as always will be a lot of them! We are all excited about the prospect of the year to come! Read our annual reports here!